"The Jurists” is one of the leading journals of law in China, one of the core Chinese journals of humanities and social science, as well as one of the Chinese Social Science Citation Index (CSSCI) source journals. It is also a publication fully included in the “Comprehensive Evaluation Database of Chinese Academic Journal ", " Database of Chinese Humanities Social Science Citation "and" China academic Journal (CD version)". With open and fair evaluation criteria as well as the principles of “pursuing the truth, concerning the reality, sticking to spirit of law and promoting justice”, ”The Jurists” searches for articles which are originally creative and close to the reality, which also pays special attentions to researches that concern significant topics, which has high academic value and makes a difference in some relevant researches, which seeks to show the frontiers of legal research in China as well as promote development of science of law. 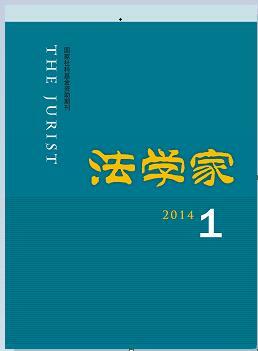 Founded in 1986 as the "Journal of Study"(Legal Version) and later titled the "Study and Research of Law," which once had hundreds of thousands of readers and has been an influential academic journal with its own characteristics, “The Jurists” was supervised by the Ministry of Education of P.R.C, sponsored by Renmin University of China and edited by Renmin Law School since 1992, and began to use its current name since 1993. It is a comprehensive law journal for the domestic and foreign researchers and scholars of law which published both domestically and abroad. The English version of “The Jurists” (Volume One), “Renmin Chinese Law Review: Selected Papers of The Jurists”, was already published by Edward Elgar in June, 2013, which is an international extension of its Chinese version.